Thanks to friends who (like us) have young children and aren't planning to party through midnight tonight, we celebrated "Happy Noon Year" today with friends, neighbors and lots and lots of kids. So if you're like us (admit it, you can't stay up past midnight unless you're reading The Hunger Games -- oh wait, that's me) and you don't have big plans, you can entertain yourself with this recap of posts from 2011. This list isn't necessarily the most popular posts, but they're a selection of posts I liked writing or ones that capture something particular to the past year. Happy reading -- and hope to see you in 2012! Where I wrestle with my religion some more. Where I come to terms with the fact that my baby doesn't need her crib. Where I admit that I don't always enjoy the company of my daughter. Where Junius gives me a vocabulary heart attack. Where I am more than done with home renovation projects. Where Junius tries out a bold new look. Where we go family camping and live to tell about it. Where Junius grows up when I'm not looking. Where I remember the day and am grateful for blessings. Where I terrify you into wearing sunscreen. Where my dad shows me he loves me. Where I bemoan one of the hardest parts of parenting and complain some about schools. If you've made it this far, then you've earned some credit for yourself. Share a link from your own blog (or one you like to read, if you're not a blogger yourself) in the comments to take us to one of your own favorites from 2011. Many of you probably kicked your Christmas tree to the curb on Monday. You Scroogey Grinches, you. But because I have a strict no-tree-before-my-birthday policy, I'm not tired of our Christmas decorations just yet. In fact, I like to keep them up until Epiphany, although sometimes they come down a little earlier because we need to get it done over a weekend. 1. Mantel: This is the first year we've actually had a mantel in a long time, so I loved having a place to hang stockings and display my nutcracker collection. Throw in some branches trimmed from the tree and a sparkly Target wreath and it all fills in quite nicely. 2. Window: No drapes in the dining room? No problem. Just hang some of those leftover balls that wouldn't fit on the tree. They're even pretty at night, but especially fun sparkling in the sun during the day. 3. Cards: We're lucky to receive lots of cards from friends and family across the globe -- but I've never had a good way to display them all. This year I stretched string across those quick-release hooks along the empty dining room wall, covered the hooks with bows and used kid-painted clothes pins to hold the cards on. Next year, I think I'll do three rows so I don't have to cram them in so tight. 4. Napkin rings: These little gems are not only festive and useful for setting the holiday table, they also provided a craft project that distracted my kids for about 15 minutes while I was cooking on Christmas Eve morning. Just cut toilet paper tubes into thirds, cover with stickers and enjoy an instantly festive table. 5. Carolers: If you've been reading this blog for a couple of years, you know I can't take credit for these winners. My crafty neighbor one-upped herself again (see brilliance from 2010 and 2009), using my one leftover Halloween pumpkin and four of her own to create this caroling crowd that she left on my doorstep. In case you can't see their song sheets, they're singing "Silent Night" (*snort*). You can only wish you lived across the street from her, too. So what was your favorite holiday decorating trick this season? Share your best so we can add it to our list for next year. Update 12.29.11: It worked! Thanks to Molly's contest with Tempur-Pedic, we'll be getting a brand new bed! Recently I've shared some of my favorite details from our big renovation project, along with pictures of my house. But in case you think that my home is all clean and sparkly and new without any mess or chaos, let me make a little confession. My guest room? Total disaster. I'll let you see for yourself. Nonna and Grandpa -- I promise we'll be ready for you by Saturday. And if it weren't for the prospect of winning a Tempur-Pedic bed (courtesy of Molly), I would never have given you that video tour. Part three of an occasional series about what I'm enjoying in my "new" house one year after we started our big renovation project. The dining room isn't the only space that will feel different for the holidays this year -- the family room got a total overhaul as well. Last year we were able to get a tree in there about a week before Christmas, but the room was otherwise mostly empty given that most of our belongings were boxed up in the guest room or stashed in a pod in our driveway. 1. Bookcases: The biggest feature we added to the room is the built-in bookcases flanking the fireplace. As lifelong book nerd and former English teacher, I love having books out and available. There are still more books in boxes upstairs, but at least I've got lots out where I can see them. Plus, what you don't see are all the toys tucked away inside those cabinets. 2. Dictionary shelf: In case having lots of books isn't nerdy enough for you, I also love being able to have a big, fat dictionary open and ready. Yes, I know you can look up anything on the internet. But it's just not the same. 3. Fireplace with mantel: Our old fireplace had a crumbling brick facade and no mantel -- nothing for hanging stockings or displaying treasures. Now we have sparkly mica tile (complete with a keystone) and a gorgeous mantel that ties into the book cases on either side. IT's so pretty that we didn't want to cover it up with a big fireplace screen (and it's just gas logs anyway), so we found this funky metal design with leaves and birds -- a great bit of quirky on an otherwise traditional design. 4. Media cabinet: No, this photo doesn't look pretty. But that's exactly the point. All those cables and boxes and electronics stay hidden inside that cabinet below the TV. And thanks to some kind of magical sensor that my husband installed, the remote works through the wood cabinet doors to run the TiVo box inside. 5. 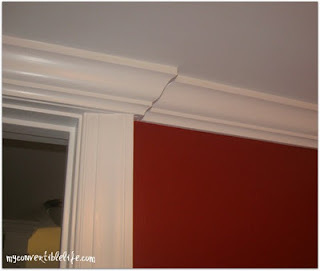 Trim work: The beautiful molding around the bookcases isn't the only trim detail in the room. Our talented architect and carpenter (who also created the bookcases and mantel) added a column effect at the corners of the room, which is open to the kitchen on one end and the foyer/hall on the other end. It's a great touch that helps separate the room (and the wall colors) without taking up any real space in the floor plan. What little details make your family room great? 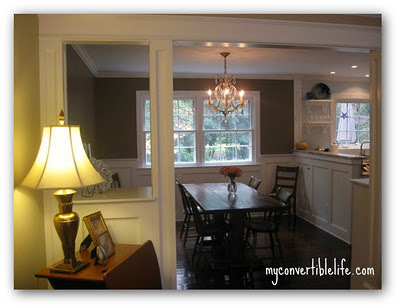 Or what projects are you plotting to turn the space into the room you're imagining? I think I liked it better when we didn’t have all these so-called choices. The new student assignment plan for Wake County is supposed to create stability and give parents greater control over their children’s educational options. All it’s creating for me is headache and heartburn. Junius is a first-grader at our original base assignment – a year-round elementary school just over a mile from our house. While it isn’t our “neighborhood school,” it is close by, the schedule works well for us and we’ve had good teachers there. But under this new plan – for better or for worse – I find myself wondering about other options. Wouldn’t it be great for him to have Spanish instruction every day? Or maybe he’d excel in a program with smaller classes? Or would he get more benefit from the consistency of six years in the same school? And will any of the schools on our list even have seats available for second graders? One of the toughest things about parenting is the millions of decisions, both small and large, that have to be made every single day. Do you vaccinate? Buy only organic foods? Do you let your daughter wear a tutu to church? When is bedtime? Who do you trust to serve as guardians in your absence? 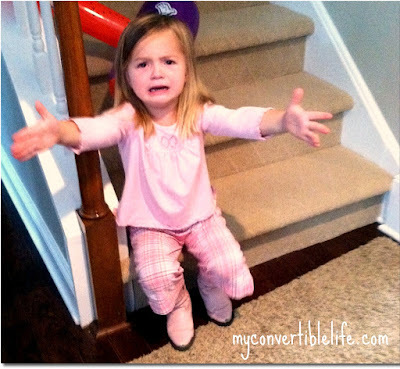 What’s an appropriate punishment for a 3-year-old who tells lies? Is your son sick enough to stay in bed or is he just trying to skip school? Is he too young to watch Star Wars? What school is the best fit? 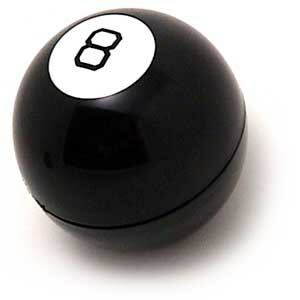 Where’s my Magic 8-Ball when I need it? The truth is that I’m tired of being the decider. I just want to know that everything is working out for the best. I want to believe that any school he attends will be the right one, that every teacher will challenge him with high expectations, that his classmates will encourage him to excel, that every experience will help him grow into a successful adult. So how will I know if we made the right choice? Today Junius came home with information about Math Superstars -- it's an extra math program that his teacher offers during lunch once a week to give kids a chance to explore problem-solving and logic beyond what they're doing in class. It involves some extra homework, but also a chance to do independent thinking work. I'm a supergeek -- we all know that already -- so I'm totally psyched about Math Superstars. As part of the info packet, his teacher included a sample sheet of problems for a test-run. I'm proud to say that Junius got five out of six problems right without any help. After he finished, we talked through the questions to see how he got to the answers. I mean, I didn't expect a first-grader to understand enough about percentages or probability to get that one right. I expected him to pick the bird since that's where the arrow was pointing. "How did you know the answer was fish?" I asked him. His response? "Well, I figured that Julio and his parents might be allergic to dogs or birds, but they probably wouldn't be allergic to fish." Looks like we've got a qualitative -- not so much quantitative -- researcher on our hands. Part two of an occasional series about what I'm enjoying in my "new" house one year after we started our big renovation project. Last year, in the midst of renovating most of our downstairs, we hosted Christmas. It wasn't fancy, given that most of our furniture was still outside in a pod in our driveway. But we made it work. 1. Open space: Because the space was small, we opened it to the kitchen (by removing the top half of the wall) and living room (by widening the doorway and adding the pass-through openings between the columns) to give the illusion of more space. It's a less formal space that way, but it also means that we use it every day now. 2. Woodwork: The wainscoting adds interest to the room and dresses it up a little. It also breaks up the expanse of wall along the side of the house, so we could use a darker wall color above without having it overwhelm the room. 3. 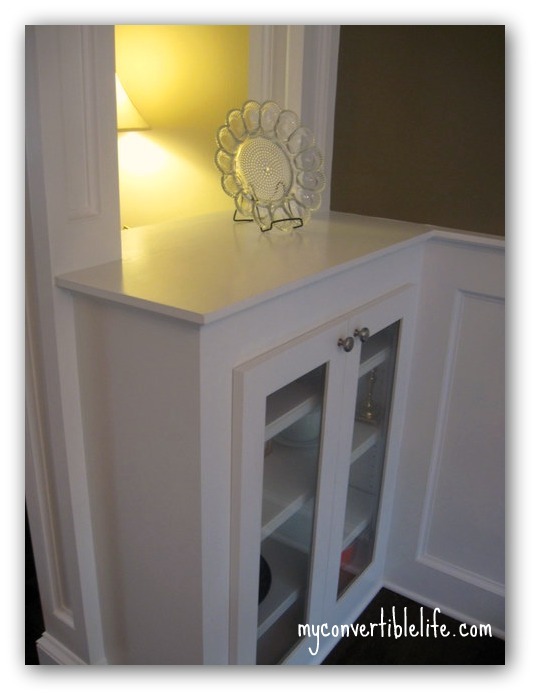 Display cabinets: Again, because it's a small room, we didn't want to put a lot of furniture in the space. But we desperately needed storage. So our talented carpenter built cabinets into either side of the doorway with the living room. Now we have beautiful storage/display space inside the cabinets, as well as serving and display space on top. 5. 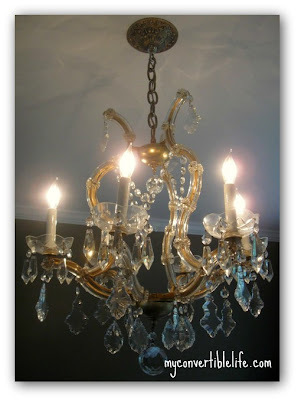 Chandelier: The piece de resistance in this room is definitely the chandelier. Originally a gift from my husband's grandparents to his parents when they were married, my mother-in-law passed it on to us a few years ago. We waited until the renovation was complete before installing the fixture. It's tough to capture with my amateur photography (which may or may not have been done with my iPhone), but the design is funky and sparkly and beautiful. Combining the fancy lighting with the rough table adds just a little touch of quirky to the room that makes me very happy. Now all I have to do is order our Fresh Market holiday dinner, and we're ready to go! You were sitting in the lobby area before dance class with your screaming, crying, wailing daughter clinging to your lap, her face the color of rage. I was running late, so I missed seeing whatever brought on the trauma -- but it sounded like maybe it had something to do with her leggings. I just wanted to tell you... what, I don't even know. But somehow I wanted to wave a magic wand and make it all stop. Not because she was bothering me, which she wasn't. Simply because I felt so terrible for you -- both of you -- that your Wednesday afternoon was melting down into madness. I know that moment. The one where you're silently wrestling over the lesser of two evils: a) standing strong in the face of the fit because dammit you PAID for these dance classes and they ARE fun and she WILL go to class and enjoy it or b) tucking her under your arm and taking her fit-throwing self home because you're both just too exhausted to do anything else. After more than six years of parenting, I'm no closer to knowing the right answer to that debate. All I really want you to know is that I'm not judging you, that I stand in solidarity with you and that I hope you got a very early bedtime tonight. But then I had one of those early evenings where everything is going along fine and then, suddenly, Pippi goes completely deaf to the particular pitch of my voice and she ignores every single thing I'm saying to her and loses one of her brand new gloves on the walk home and just grins while I dissolve into fist-clenching frustration. So she ended up back in this familiar spot while I had a glass of wine and put the pizza in the oven. And by the time I'm finally back at my computer to finish up this afternoon's post, all I can think is who the hell am I to be offering magic wand wishes to another mom? Here's hoping that all of us have smoother days tomorrow. Singing along with "The Sing-off"
Reality TV has never been my thing. Unless you count HGTV or the occasional make-over show, I'm just not that into it. Although I will say that Storage Wars is pretty interesting -- but not enough to make me set the TiVo. Survivor started while I was living overseas -- when I got back, I tuned in once to see what all the fuss was about and just couldn't catch on. Maybe because I didn't care about any of the people? Or possibly because I'm grossed out by the notion of eating bugs. I watched a few episodes of American Idol when a Raleigh contestant was in the finals, but that's about it. I have enough reality in my life -- when I turn on the TV, that's not what I'm looking for. So imagine my surprise to discover that I am completely and totally sucked into a reality show this season: The Sing-off. I stumbled onto it a few weeks ago when I was home by myself (translation: in control of the remote and looking for anything to watch other than Two and a Half Men). I started watching because I heart Ben Folds. After two songs, I was hooked. Finally, a reality show I can enjoy. A capella groups of all shapes, styles and sizes singing and dancing their hearts out in front of judges who are genuinely talented and seem to honestly care about the performers. If you're not already watching (and come on, admit it, some of you are), then you better start tonight -- it's the next-to-last episode and you WILL be sorry if you miss it. And my prediction of the group to take it all? Pentatonix. Think I'm wrong? Share your prediction in the comments. The show starts tonight at 8:00 on NBC. A year ago this month, we started our big renovation project. Looking back, I'm so glad we did it -- but I'm also a little amazed that we survived it all. In celebration, I'll be sharing some of my favorite things about our "new" house over the next few Fridays. 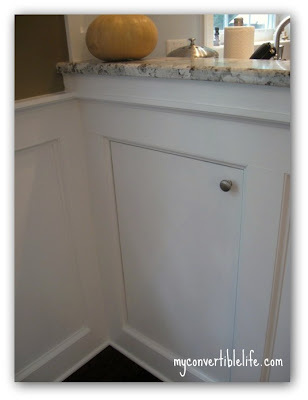 Today, we'll look at an often overlooked little room: the powder room. Ours is tucked between the foyer and the family room near the stairs. It's small and has a low-ish ceiling -- but you can see it from the kitchen and we walk past it every time we go to the front door. So even though it's not a big space, it still needs to look great. 1. Magazine rack: Yes, the bathroom doubles as a library -- as if you can honestly say you never read in there. 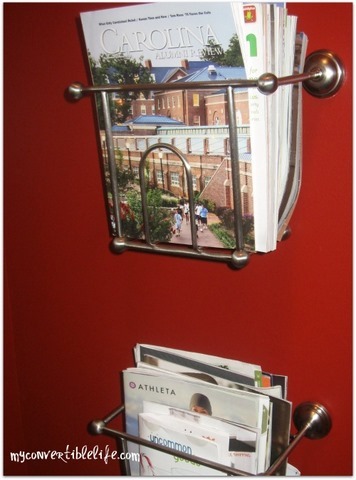 Plus this way I have a storage area for all our catalogs and magazines that isn't my kitchen counter (where these things used to pile up). The brushed nickel finish matches the faucet and ties in with the floor. 2. Pedestal sink: Small enough to fit the space, but still substantial enough to have a presence. 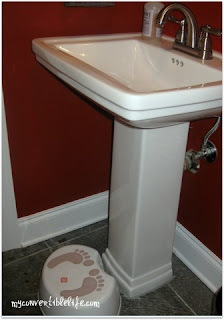 So maybe the footstool isn't so classy, but I love the rectangular bowl and squared off base of this sink. 3. 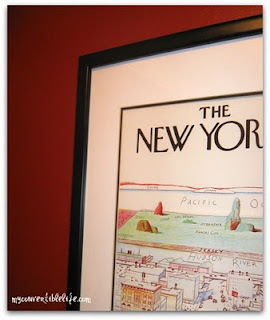 Wall color: Because the rest of the downstairs walls are painted in more neutral shades, the red is fun in the tiny room. And it coordinates perfectly with my favorite cover print from The New Yorker magazine. 4. Molding details: Not just crown molding, but molding that accommodates the lower ceiling (because of plumbing from upstairs) and makes it beautiful above the doorway. 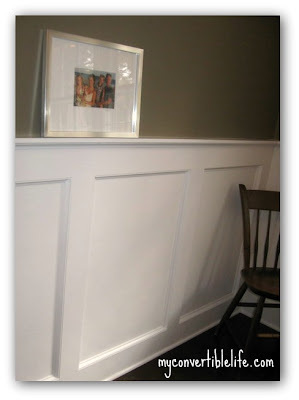 Only a fabulous finish carpenter would think of such details. 5. Tile floor: We used the same tile from our new hearth, in the adjoining room -- it looks like slate, but is actually tile with tiny mica flecks that make it silvery sparkly. 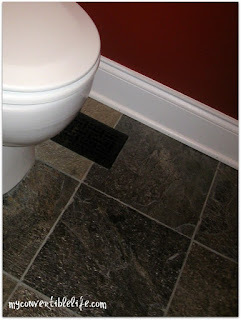 Not so warm on the feet, but it hides every speck of dirt and adds a little flair to a very small space. Also notice the fancy register cover. What's your favorite touch in your powder room? Or what project are you planning to improve this small but essential room? My dad still uses the mail. You know, the write with a pen on paper U.S. postal service lick the envelope stick on a stamp drop it in the box kind of mail. It's one of the many things I love about him. I started getting letters from him when I went away to college -- that was pre-email (ahem) and pre-free-long-distance-on-my-cell-phone (cough) days, so mail was a primary communications tool with my family. But even now, when he's got email, cable phone and texting at his fingertips, I still get the occasional envelope in the mail box from my dad. More often that not, the envelope contains an odd assortment of newspaper and magazine clippings. Occasionally, one of them is a wedding announcement for someone I knew in high school, although those have become less frequent as I've gotten older. Sometimes it's just something quirky that caught his attention. Or it's something relevant to a part of my life or recent conversation we've had. The recent pile you see here includes a photo feature about fathers and daughters, an op-ed about Mitt Romney, an op-ed about Art Pope and The New Yorker and a spotlight on a local restaurant owned by my college roommate's family. Always a hodge-podge. 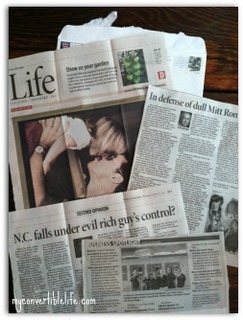 The articles are generally interesting or at least a little trip down memory lane. But what really makes me smile when I get a collection in the mail is knowing that on any given ordinary day, while he's sitting at the table reading the paper and eating his morning bowl of cereal, my dad is thinking about me. This is from last year. But I love it too much not to share it. We were walking home from the bus stop and he was just neck deep before I could even stop him. The sheer bliss on his face actually made me forget (for a moment) about the laundry and the bath that would be required later. Capture the Everyday is about getting you to capture those everyday moments in your life! 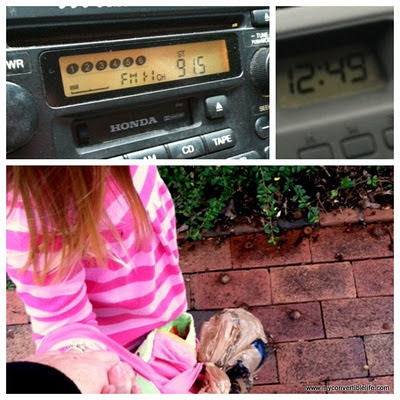 Each Tuesday, Melissa at Adventuroo will issue a simple challenge to capture something that’s a part of your daily life. You can post just a picture or add some words to go along with it. You’ll have a week to get it done and then she’ll issue another. It’s a quick, easy way to start capturing those little parts of life we sometimes take for granted. When Junius was a baby, I thought he would be this tiny, needy, helpless (and adorable, but still exhausting) bump on a log forever. And I was terrified. I looked at my friends with toddlers and school-aged kids and longed for the day when my child wouldn't be attached to me in such a literal way. Of course, as it turns out, those early days quickly disappeared. Sometimes I miss the baby days, but I also enjoy the advantages of not having an infant in the house. 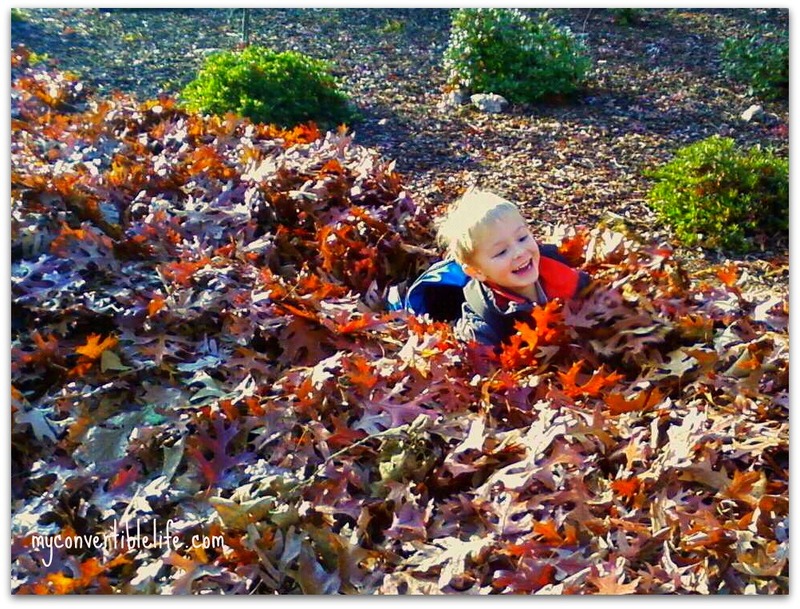 Now that I've got a 6-year-old and an almost 4-year-old, life looks really different. But I've been noticing lately that there are good and bad sides to having kids who are getting older and more independent. So for those of you still wandering in the hazy exhaustion of newborn-ness, here are five trade-offs that you have ahead of you. The Good: Now that Junius can read he can better entertain himself and Pippi. He's also better at answering my questions because he has access to a lot more information. The Bad: Now he can read everything -- including speed limit signs (which may or may not correspond to the speed of my car), event announcements (that I wasn't planning on taking him to) and other less appropriate material. It's like baby-proofing, but different. The Good: Junius gets himself up every morning and gets dressed before waking us up -- he's our school day alarm clock. And now Pippi is old enough to dress herself, too -- great that the only person I have to dress in the morning is myself. The Bad: There's no telling what they'll come up with. For Junius, it's probably red gym shorts with a different-shade-of-red t-shirt. For Pippi, well... she could go through as many as four (ahem) unusual selections in one day, usually involving something a) sparkly, b) pink, c) flouncy, d) too big/small or e) all of the above (see photo). The Good: My kids can make their own breakfast now, reach the snacks in the pantry and fix juice out of the fridge -- again, one less chore that falls on my plate. The Bad: They're making their own food choices sometimes without asking, meaning they're fixing Chex Mix for breakfast or eating the last banana that I needed for smoothies. The Good: Because Junius really is our household alarm clock, it's very helpful for him to be able to tell time. It's also nice to tell him that a friend is coming over at 4:00 and have that actually mean something. The Bad: It's a lot harder to convince him that it's time to go to bed when he can look at the clock and tell that it's only 6:15. The Good: So it's probably not our most stellar parenting move, but we've discovered that we can sleep in a little on Saturdays now that the kids are able to work the TV (including the TiVo) on their own. Hey, I still remember sitting in front of the test pattern with my brother on Saturday mornings waiting for cartoons and I turned out okay -- trusting that my kids will, too. The Bad: If we're not up with them, then they're choosing their own programming -- which is often the Disney channel (and I'm sorry, but I think most of those shows are terrible) or occasionally something less-than-kid-friendly from TiVo. As they say, the grass is always greener... If you've got a newborn, what older stage are you looking forward to? Or if you've got older kids, what mixed blessing of the future should I be worrying about now? "Mommy? There is gooey on my finger." That sentence is not something I really want to hear at any time of day. But especially not coming from my child at 4 a.m. So I grab my glasses from the nightstand and fumble my way into the bathroom to find Pippi standing beside the toilet. She's holding her finger up in the air, her pull-up and pajama pants around her ankles. I grab a tissue, wipe her hand and reach to pull up her pants. And that's when I realize what was on her finger. Somehow, even though she's been waking up dry for weeks, tonight she has slept through pooping in her pull-up and didn't realize it. That is, until she stuck her finger in it. And yet, somehow she's so sweet about it and appreciative of my help and just happy to have some quality time together in the middle of the night that I can't get mad at her. I wipe her bottom, scrub our hands, find a clean pull-up, get her pajamas back on and carry her to her bed. As I'm tucking her in, she says, "I love you, Mommy. You are the Best Mommy Ever." Then she smacks my hand with one of her noisy little kisses and grins at me over the edge of her blanket. Melty hearted, I drag back into my bed, fluff my pillow and settle back in toward sleep. Except that Pippi isn't done yet. And that's the roller coaster of motherhood. One minute I'm all weak-kneed in love with the girl. The next minute she's wailing for me from the other room and I'm wondering why she hates me so much. An hour later, we were finally both asleep. One more hour and we're starting another day. One more crazy ride. Photo: Self-portrait by Pippi has nothing to do with the story except that I thought it was funny. Full credit for this recipe goes to Ilina at Dirt & Noise. She was pinning all these great pumpkin recipes last week and I had this pumpkin sitting on my counter from The Produce Box (not the jack o' lantern pictured here, of course -- but I'm still very proud of my first-ever carvings). So I asked her for an easy but tasty recipe recommendation. Roast pumpkin and cook until soft. Scrape out seeds and reserve pulp. On medium heat, cook onion and garlic in olive oil until slightly browned in a dutch oven. Add apple sauce, chicken broth, orange juice, wine and give it a stir. Turn heat to low. Mix in pumpkin and seasonings. Simmer for at least 20-30 minutes, stirring occasionally. Take off the heat and whisk in the cream. Use an immersion blender or puree it in batches (though this step is not necessary). Serve with bread and garnish with fried onions and cashews. It turned out delicious -- plus I'm super impressed with myself for being able to say that I made pumpkin soup from scratch. But I do have a few notes to go along with the recipe. Not knowing how to roast pumpkin, I googled it and came up with this solution: Preheat oven to 400 degrees F. Place the pumpkin cut side up on a parchment lined baking sheet. Season with 1/2 tsp salt and 1/4 tsp pepper. Turn cut side down and drizzle with 1 tbsp olive oil. Place in oven and roast until skin is golden brown and the pumpkin is tender, 50 to 60 minutes. Remove from the oven and allow to cool. Next time, I think I'd use less orange juice -- unless maybe I had a bigger pumpkin. Don't skimp on the spices -- they're yummy. I did use my immersion blender because it makes me happy and makes the soup smooth and lovely. And sadly I didn't have any fried onions or cashews in the pantry, so I just crumbled Saltines into my bowl -- the saltiness is a nice balance to the soup flavor. Junius didn't like it, but Pippi did -- so that makes it a win at our house. Now go show Ilina some blog love (remember what we talked about on Friday?) and then leave us a link to your favorite pumpkin recipe here in the comments. After weeks of crazy schedules combined with just generally being slack, I finally got back to reading some of my favorite blogs yesterday. Trying to catch up on friends (both the ones I've met and the ones I only know online) reminded me of one of the things I like best about blogging: community. We have a great group of bloggers in my area who get together now and then -- I'm lucky to be a part of a group of smart, interesting ladies who like writing and appreciate my grammar geekiness (that's two of them in the photo with me at last year's blogging conference). But beyond that, I love the virtual community that exists online through blogging. It's knowing that I can leave a comment on a blog about a friend's terrible day. Or discovering that a long-lost friend is enjoying my random stories. Or finding a new writer with a mutual love of precise language and snarky stories. If you have your own blog, you probably already know all of this. But if you don't (or even if you do), you might be reading blogs without thinking about what's happening on the other end of the screen. Leave a comment: The only way we really know that you read a post is if you leave a comment. And despite what you might think, most bloggers aren’t just writing to “hear themselves talk.” We actually want to have a sort of conversation with you. Share your own related story, post a reaction or just leave some words of encouragement. Share a post: Read something that catches your attention? Email the post to a friend, link to it on Facebook or tweet about it. That's the beauty of posting all these stories, jokes, rants, recipes and recommendations online -- it makes them easy to share. Suggest a topic: Need advice? Just want someone else’s perspective on something? Tell your favorite blogger and see what she (or he) can do with it. Click a link: Most blogs will have an archive or labels or tags of some sort to categorize old posts. Unless you’ve read every post since a blog was born (hi Mom and Dad! ), you might have missed something great. Pick a category at random and see what comes out of the archive. Subscribe: There are multiple ways to follow most blogs – “like” them on Facebook (or use the Networked Blogs app), subscribe by email, follow on Twitter or add them to your RSS feed. That way you never miss a post. Now let's test what you've learned -- leave us a comment with a link to one of your favorite blogs (other than mine, of course) and let's share the love. Nearly always smiley and happy. Often silly or goofy. Occasionally grumpy or frustrated. But blessedly, almost never stern or evil. So that's why his Halloween costume was so disconcerting this year. With that horrible, hard plastic Anakin Skywalker mask on, we couldn't see his smile. And with the way the cut-outs were shaped (or maybe just because the whole thing was so weird), we couldn't even see if his eyes were smiling. Every time I looked at him, I got sad and worried. It was like some sort of creepy glimpse into a future teen-aged Junius who sulks around, refuses to smile and dyes his hair. So let this serve as a cautionary tale to the rest of you moms out there. Next year, don't let your babies grow up to be kids who wear angry masks as part of their Halloween costumes. Halloween got rained out at our house tonight. Thankfully, our kids are young enough that they didn't seem to care. Plus, they'd already had a neighborhood costume parade on Sunday (complete with pinata) and trick-or-treating around Daddy's office on Monday afternoon. So they're not exactly starved for candy. We hit a couple of milestones for Halloween this year. For Junius, it was his first year dressed as something in a full face mask and carrying a weapon (Anakin Skywalker). Wearing the full mask was really creepy -- even though it was just a hard plastic face -- because it made him look so stern and angry. That's not his normal look. And for Pippi, I suspect this may have been my last year for enjoying her in a non-princess-based costume. The allure of the tiara is strong. But it turns out that the ears were a bigger draw for her this year. In case you can't tell from the close-up, that's her Olivia costume. I love that she picked that one -- over Strawberry Shortcake and Cinderella -- because it suits her personality oh-so well. Olivia also comes with happy memories for me because I bought a hardback copy of Ian Falconer's original book in French when we were in Paris more than 10 years ago. At the time, I had no idea it was an American story and soon-to-be Nick Jr television show. Oh, and in case you're wondering, that's a Halloween kazoo in her mouth. You just never know what sort of treats they'll be handing out at Daddy's office. We all stay really busy around our house. Like most families, we're passing ourselves coming and going from gymnastics, preschool, dance class, elementary school, hockey, work, church, work, friends, volunteering and who knows what all else. But it turns out, it's not just the people in my house who are busy. It's also our loveys. 1. Lulu at work: Lucky for Lulu, she’s in an office that’s been named one of the Business Journal’s “Best Places to Work.” That doesn't means she's not working hard -- but at least she gets some good benefits. 2. Lulu on coffee break: I'm pretty sure she's drinking decaff while reading the Wall Street Journal. She's in public relations, so it's important for her to stay current on the day's headlines. 3. Lulu eating her lunch: Everyone has to eat, even loveys. But there's no time to stop working, so she's eating at her desk. 4. Lulu proofing a press release: Before heading home for the day, she checks to be sure all the i's are dotted and the t's are crossed. 5. Lulu spots a punch-buggy: As part of the family, of course Lulu is also participating in the ongoing punch-buggy game. Being the giver that she is, she credited that one to Pippi's account. Yeah, so blogging every day for "A Week in My Life" with Adventuroo didn't happen. At all. But I took all these pictures each day and I'd hate for them to go to waste. Plus I think it will be interesting to look back in a year or two and see how our routines have changed. So here is our Wednesday from last week. Tomorrow will probably look a lot like this, only without Junius -- he's at Grandparent Camp for his last week of track-out. Wednesdays, even more than all the other crazy days, are a race. 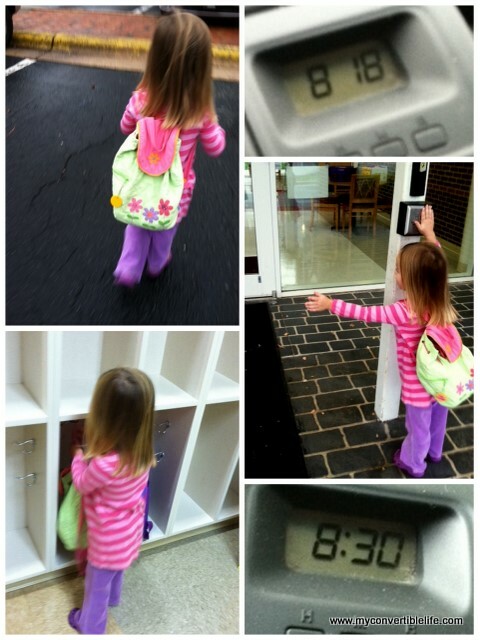 I should have Pippi at preschool at 8 a.m. so that I could be at the office by 8:30 -- but I never do. After locking the front door, loading us in the car, waiting for Pippi to buckle herself in and remembering to put my smoothie in the cup holder instead of leaving it on top of the car, it's 8:12. My husband has already taken Junius to a friend's house for the day. I drive with my makeup bag in my lap so that I can fix my face at traffic lights. At 8:18 we're in the preschool parking lot. Pippi actually carries her own backpack (amazing! 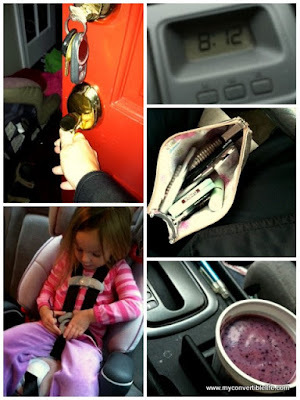 ), meanders through the parking lot, pushes the door opener (every child's favorite part of coming into the school), strolls down to her room and finds her cubby (her teacher moves their names around each day, so that way they learn to recognize their name). I get to my office at 8:30. Work work work. Blah blah blah. Me at a desk. Computer writing social media. Meetings. At 12:49, I'm back in the car and racing to preschool so I can get Pippi before she heads to afterschool care and falls asleep during quiet time. I curse the radio for the pledge drive chatter. On the way out of school, Pippi leads me through the path her class took that day on their nature walk. I remind myself to treasure the feel of her hand in mine. At 1:07 we're in the car driving home. Time for Pippi to change into her dance clothes, grab a quick snack and head downtown for Dance Play class at 1:32. 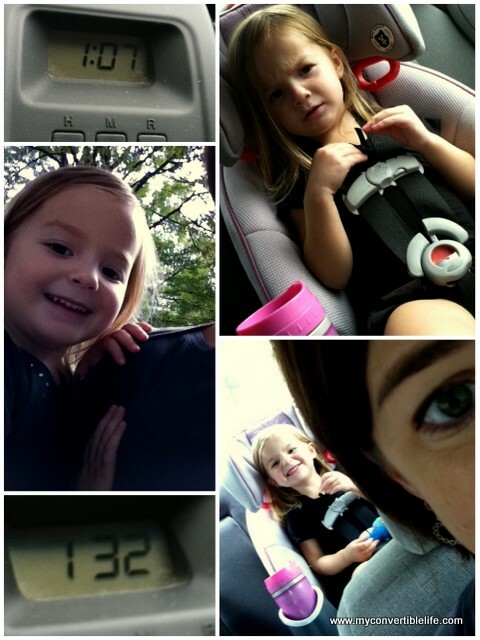 This time she claims she can't hook her own seatbelt -- it's always that last bottom piece that won't click. Her smile below is my kankoomommy for helping her. 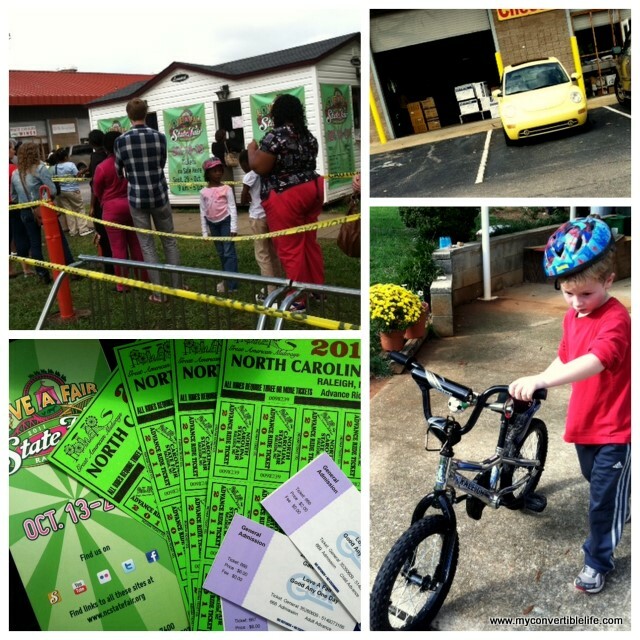 While Pippi is in class, I sneak over to the Farmers Market to get advance tickets for the NC State Fair. (I cannot emphasize enough the importance of buying ride tickets ahead of time. SO MUCH cheaper.). I only discovered the advance ticket plan this year, but apparently everyone else knew based on the line. I spy a punch-buggy yellow on my way through the parking lot. After Dance Play class is over, we pick up Junius at his friend's house and go home. While I try to make dinner, Junius takes pictures of Pippi. 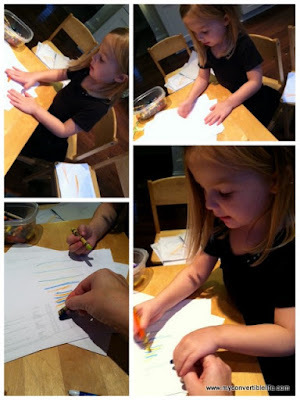 She's pretending to be the teacher and demonstrating some sort of art project. She insists that I be the student, then takes my crayon-holding hand and corrects what I'm doing wrong. At that point, I ran out of the energy required to live the day and document it simultaneously. My husband came home and we gulped down dinner. Then he took Junius to faith formation class (6:30-7:45, which means Junius is out past bedtime which is totally crazy to me) while I took Pippi through her bath-books-bed routine. On that particular Wednesday night, once the kids were in bed asleep, I sat on the couch with my laptop and wrote my post for Tuesday. I stayed up too late (as usual) and regretted it the next day (as usual). I'm assuming all of this is normal, right? I mean, the rest of you are running your own version of this marathon, right? And every time I think the slow-down is just around the corner, well... it's not. Keeping up with Adventuroo's "A Week in My Life" project. has turned out to be nearly impossible. Too much life happening to have enough time left over for writing about it. But I'm doing what I can -- check out my Monday here and my Tuesday here. Then you'll have a good idea about why I'm so tired. Friday was no ordinary day. It was Go to the North Carolina State Fair Day. If you can make it, they can fry it. More on that later, but we just couldn't resist a photo on the way in. Self-portrait so that my dermatologist will be impressed. The weather was NC perfect on Friday -- but definitely required sunscreen and a hat. The one ride we all went on together was the Ferris wheel (or, "ferist wheel," as Junius calls it). This unedited photo was taken while we waited in line. ...and here are my white knuckles as I gripped the handle. I was seriously nervous on this ride. My children were not. I spent much of the ride telling them to hold on and sit down. It's been a long, long time since my days on the Carolina Cyclone and Thunder Road. The view from the top of the Ferris wheel was very cool. But it was hard to grip the handlebar with one hand and take a photo with the other hand without dropping my iPhone. Junius really liked controlling the map. I'm not sure how well-developed his sense of direction is, but knowledge is power -- and now that he can read, he really likes having the power tools. Junius and his beach buddy directed us (more or less -- okay, less) to the animal area, where we watched the sheep getting sheared. The sheep did not seem happy about this plan. The children were mesmerized. I was considering switching to synthetic fabrics. I don't know what this lovely girl's name is, but she was one of the people showing off recently-sheared sheep in the animal section. She must be really good at it because she had on one hell of a belt buckle. Pippi was jealous. And here's another celebrity at the Fair -- my friend, the Practical Cook. In addition to being awesome because of her deep and abiding love of cereal, she is also a Deep Fried Ambassador for the NC State Fair. Seriously. She has a media pass and everything. Check out her blog -- including video of her taste tests with deep fried Kool Aid, deep fried bubblegum and the Krispy Kreme burger. I'm not kidding. Pippi was desperate for ice cream with sprinkles. Not sure you can see it here, but she ended up with sprinkles in her hair because she was so excited. While we were indulging, Junius was busy spending the last of his ride tickets (which we bought in advance because they are SO much cheaper that way). He looks kind of serious in this photo, which could be because he takes his fake four-wheeler driving very seriously or might actually be because he is flippin exhausted. By that point, we had clearly overstayed our welcome at the Fair. Thus, Pippi got carried back down the long and winding path back to the car (free parking at Gate 8, thankyouverymuch) -- first on a mommy piggy-back and then on daddy's shoulders. And before you get alarmed that I'm not wearing my hat anymore in this photo, rest easy knowing that it was dark out by then. Seriously time to go home -- but worth staying to see the Fair light up as we said farewell until next year.